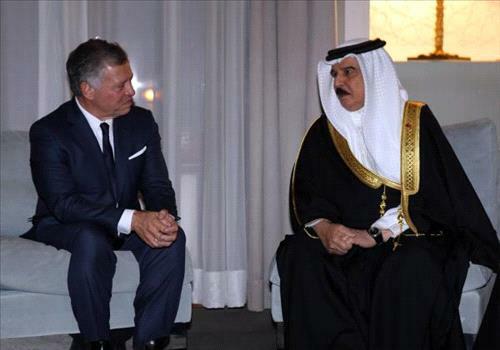 AMMONNEWS - His Majesty King Abdullah II on Tuesday met with His Majesty King Hamad bin Isa Al Khalifa of Bahrain and His Royal Highness Prince Salman bin Hamad Al Khalifa, Crown Prince, Deputy Supreme Commander and First Deputy Prime Minister. His Majesty King Abdullah II offered his condolences to the Bahraini monarch over the passing away of Sheikha Hala Bint Daij Al Khalifa. During the meeting, both leaders underlined the strong ties between Jordan and Bahrain and said they are keen to strengthen coordination and consultation on various issues of common concern to serve the interests of both nations. The meeting was attended by the Minister of Foreign Affairs and Expatriate Affairs, the Chairman of the Joint Chiefs of Staff, the Advisor to His Majesty the King, the Director of His Majesty's Office, and the Jordanian Ambassador to Bahrain.